What a week for True Blood news. We’re like kids at a birthday party standing around the piÃ±ata frantically picking up the pieces of candy and waiting for the final big thwack that unleashes the flood of treats. Less than a month now until Season 3 starts on June 13th. If you’re a huge fan like me you’ll want to follow them — TrueBlood on Facebook or @TrueBloodHBO on Twitter. Vampires, fangbangers, shapeshifters and weres â itâs time to reveal your True selves. Enter for your chance to win passes to the True Blood Ultimate Fan Experience, a $5,000 Grand Prize, everything you would need to throw the ultimate True Blood Season 3 finale party, and even more instant prizes. Are you the ultimate Truebie? Register for a chance to win two passes to the True Blood Ultimate Fan Experience: a 50-city, one-night-only event featuring a live simulcast Q&A with creator Alan Ball and cast members, a screening of the Season 2 finale and a sneak peek of whats to come in Season 3. One lucky Truebie could win a $5000 grand Prize and all the essentials for throwing the ultimate True Blood Season 3 finale party. We play at night. Do you? Come every 6 minutes and 13 seconds fro dusk till dawn EST for your chance to win two passes to the True Blood Ultimate Fan experience in your area. Your chance to win begins tonight at 6:13PM EST. Dying to know when your city is up? Follow True Blood on Twitter. You can also win some True Blood gear. You have to register for a chance to win, so go now and register. Click on the photo to enter and read more about this great Truebie opportunity! We’ve seen the official Season 3 Preview #1 from HBO. They’ll be putting it online for you to embed on your own sites tomorrow so be looking for it. If you haven’t seen it, you’ll want to check it out here. You’ll get another chance to see it tonight at 8/7c during “I Will Rise Up” as well as the minisode sneak peak. 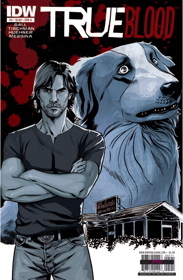 Two covers of the True Blood comics have been released. TrueBloodNet released a story clueing us in on the official (and fake) cast and crew online presences for us to follow. Sci Fi (or SyFy?) magazine is covering the awesomeness of True Blood in the June 2010 issue. The magazine, that will be out in the news stands in June, is featuring interviews with Alan Ball, Rutina Wesley & Denis Oâhare. Kathie publishes some questions with Denis, true Bloodâs King of Mississipi that you canât miss! That’s it for today, but keep checking back for more updates and if you know something we don’t, send us some tips using the contact link above!